Starting out with some beautiful, brown organic eggs. Photo by Grey Catsidhe, 2013. Spring is inching towards us in the North Country. It’s sometimes hard to believe given all the snow we’ve been getting this week. Despite that, Northern Rivers Protogrove will be bundling up and huddling around a fire to bring in the new season later today! Although the Spring Equinox is more of a modern Druidic holiday (most of what we do this time of year has grounding in Germanic, Christian, and Jewish tradition), and some more recon-oreinted folk skip it entirely, I find it hard to pass up the excuse to celebrate. It’s been a long winter for us, and we’re ready to welcome spring! Eggs are a huge part of my Spring celebrations. They have been since childhood when mum helped us dye eggs for Easter. Now that I’m expecting, I find myself looking forward to doing similar projects in a Pagan context. Last year I struggled a bit with how to fit the egg symbolism into my Druidic take on the Spring Equinox. This year it seems more natural, even without the lore of the “Druid Egg.” Keep it simple, stupid – eggs have symbolized new life and rebirth for countless generations! So this modern Druid still likes to dye eggs in the spring. Each year I say I want to use natural dye methods to color my eggs. Each year I get lazy or forget to buy the ingredients. This year I decided to try anyway! The result wasn’t all that great, unfortunately. This is due to my not having dark veggies, like beets or red cabbage. Hubby and I work very hard to buy local eggs. When we can’t get ahold of them, we go to the health food store and buy some organic, free range eggs*. They’re almost always brown. Occasionally we’ll get some local eggs that have a mixture of white, green, and brown, but not often. 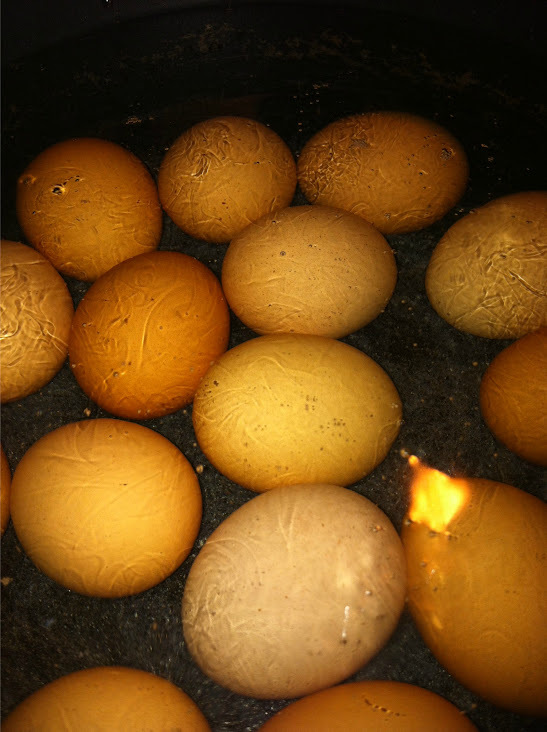 Although there are plenty of websites out there that say dying brown eggs is possible, it is hard. I decided to try using green tea. I have a surplus of caffeinated tea I’m avoiding right now, so why not? 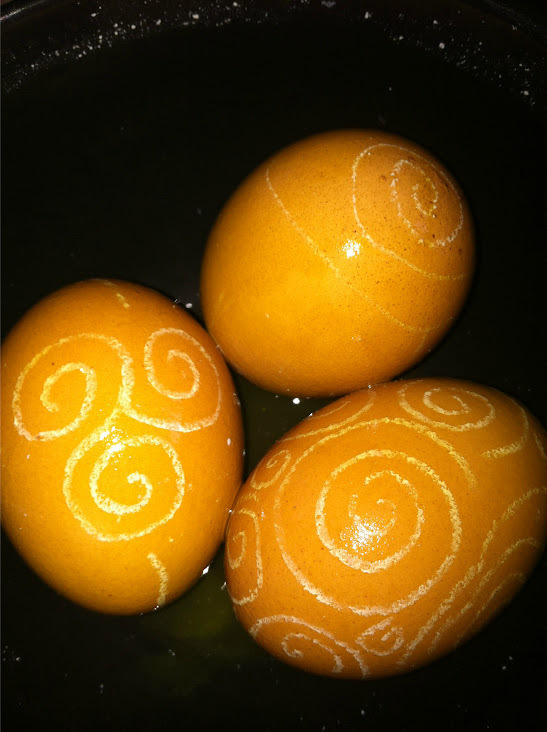 First, I used a white crayon to draw some designs in the eggs. I added vinegar, hot water, then a few tea bags. I left them in the fridge overnight and went to bed. Success with the white wax! The dye? Eeeeh…. Photo by Grey Catsidhe, 2013. The results were VERY subtle. So subtle that it was probably impossible for this novice to photograph. The white swirls from the crayon look amazing but the much hoped for green hue was more of a slight yellow sheen over the already brown eggs. It’s obvious that darker veggie matter is required for dying eggs – at least overnight. Perhaps repeated and longer soakings in green tea would have had a greater impact, but meh**. I caved and am currently redying them with a few drops of green food coloring from the cupboard. I’ll try again next year! And I will definitely add beets or red cabbage to my shopping list ahead of time. Unfortunately you reallyneed white eggs but you can always pretend you used onion skins. Earl Grey would have just made a darker brown. They still look pretty. Does anyone in your area have free range Auracana chickens? I’m not sure but I’ll look into it!